Angioedema is an uncommon and usually self-limited swelling of the deep dermis. It can, however, be complicated by potentially serious adverse consequences, including death. Although IgE-mediated mechanisms are not the major cause of angioedema, they are among the few that can be clearly identified, and thus this topic will be discussed here. 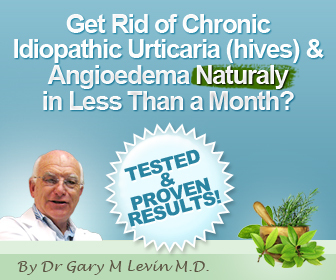 Angioedema occurs together with urticaria approximately 85% of the time; in 15% of instances, it occurs alone. Angioedema (Fig. 1) is the abrupt and transient swelling of the skin, mucous membranes, or both, including the upper respiratory and intestinal epithelial linings (11). In some cases, angioedema and urticaria should be viewed as varying manifestations of the same pathologic process, and they are common components of anaphylactic reactions. Angioedema involves the reticular dermis and subcutaneous or submucosal tissue, particularly of acral areas, while urticaria involves the papillary dermis and mid-dermis throughout the body. The depth of involvement will result in different clinical presentations. Urticarial lesions are erythema-tous, short lived (<24 hours) and intensely pruritic, while the swelling of angioedema is nonpitting, pink or skin colored, more persistent and described as burning, stretching, or painful, rather than pruritic. The prevalence of angioedema is not well characterized. It is said that up to 20% of individuals experience urticaria at some point in life and that half of such patients also have angioedema; however, chronic urticaria/angioedema (persisting more than six weeks) is much less common (approximately 0.1% of the population). Anaphylaxis occurs at a rate of approximately 30/100,000 person-years. Urticaria/angioedema are among the most common manifestations of anaphylaxis, appearing in about half of all such occurrences. IgE-mediated mechanisms have been shown to cause approximately 60% of anaphylactic reactions and are common causes of acute urticaria/angioedema. Its role as the cause of chronic angioedema, however, is much less clear, and in most instances of chronic angioedema, no causative factor is identified. In some of these patients, physical urticaria/ angioedema such as that caused by exposure to cold, or exercise-induced anaphylaxis, has been demonstrated to be responsible.